The rugged Old West meets New West in a tiny Wyoming town. Marcia Hensley is a contributor to Writers on the Range, the opinion service of High Country News. She divides her time between the Denver area and Atlantic City, Wyoming. Visiting friends last summer in Atlantic City, a tiny town at the foot of Wyoming’s Wind River Mountains, I heard the locals discussing a different kind of tourist they see on the street. The visitors are hikers and bicyclists seeking a break from their months-long journeys on the Continental Divide Trail. I’d seen recent movies dramatizing on-the-trail experiences: Cheryl Strayed’s Wild, about hiking the Pacific Crest Trail, and A Walk in the Woods, on Bill Bryson’s experience on the Appalachian Trail. But finding outdoor adventurers like them in Atlantic City, with its wild-West aura, was a surprise. Before they even reach Atlantic City, hikers have to step back in time: They leave the Continental Divide Trail and find themselves on the main street of South Pass City, a restored boomtown, circa 1897. It still has some perfectly preserved cabins, a schoolhouse, saloon and a mercantile shop. South Pass has little else to offer beyond a mail drop site for the trail, so after trekkers check for mail, some return to the trail. But others, seeking a camping spot and hearty meal, continue onward, 3 miles into Atlantic City, elevation 8,000 and population only 52. There, they find a rustic scattering of historic log buildings and a couple of good places to eat. If they need a major resupply, bustling Lander is a detour of 40 miles east. The town of Atlantic City, Wyoming, a welcome sight for weary travelers on the Continental Divide Trail. Once seated in the café in Atlantic City, hikers and bicyclists are usually happy to talk to locals about their trail ups and downs. Most know from reading other hikers’ websites, tweets and blogs that the Continental Divide Trail has few hostels or “trail angels” willing to assist hikers. That’s one of the reasons the Continental Divide Trail is the most challenging of the long-distance trails. At 3,100 miles, it’s also the longest of the three and is still partially unfinished. Most hikers tackle the Pacific Crest and Appalachian before attempting the Continental Divide Trail, which intersects several times with the Great Divide Mountain Bike Route, developed by Michael McCoy. Trail logbooks provide colorful stories of hiker’s reactions when they’re in Wyoming. “Holy Cow! Where did we end up?” one hiker wrote at finding the 19th century alive and well in South Pass City. He was a SoBo (trail lingo for southbound), just down from the Wind River Mountains about 100 miles north. He was headed into the Great Divide Basin, across 167 miles of high desert to the next resupply opportunity, at Rawlins, Wyoming. From there he might venture into the Colorado Rockies and, if he’s a thru-hiker, his ultimate destination might be trails’ end at the Mexican border. Atlantic City locals figure about 70 to 100 hikers and bikers pass through, usually from May through September. They come from places as far away as Finland, New Zealand, South Africa, Canada, Scotland and France, as well as from all over the United States. Some townsfolk who were leery at first of this outside intrusion have since found themselves becoming trail angels. They offer rides into town, backyard spaces to camp, warm showers and help with bicycle breakdowns. When a bicyclist collided with a cow, locals took the injured person to the emergency room in Lander. “Love, love places like this,” wrote a hiker in the Grubstake Café logbook. 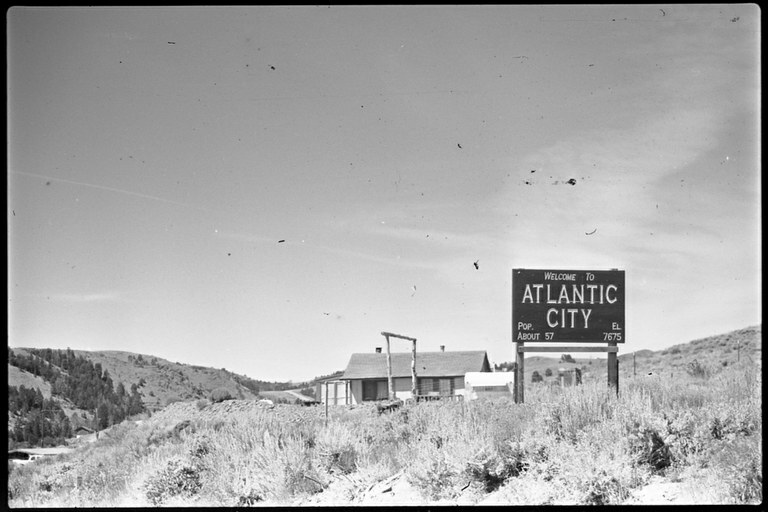 “Makes it hard to imagine going back to ordinary life.” For the few hardy souls who make Atlantic City their home, this old-fashioned place is their ordinary life. Meanwhile, as contact with trekkers increases, the town is stepping up. A gun shop owner now also stocks trail food, medicines and basic hiking gear, and a couple of small cabins and a bathhouse can be rented for a modest fee. Locals contribute free supplies to Hikers’ Boxes and sometimes follow hiker’s blogs to see how their trips are progressing. And hikers send postcards back to their new friends here. “Wild, wild, country — not for wimps,” wrote one hiker who had just crossed the Great Divide Basin. That’s something the Atlantic City natives understand. Despite the frontier charm of this mountain town, the cold can be dangerous and the wind brutal, as one late-season hiker discovered. Luckily, he found the church unlocked and sheltered overnight there. If hikers or bikers aren’t through South Pass by mid-September, they are likely to find snow in the higher elevations in both directions. Experiences on the trail are the main story for hikers and bikers, but off-trail there’s a sub-plot that may be equally important. In this unlikely Wyoming crossroads, trekkers and locals find common ground in the landscape’s gifts of beauty, isolation and the challenge of living close to the natural world. Note: This article has been updated to reflect the correct mileage of the Continental Divide Trail, and that it intersects with the Great Divide Mountain Bike Route.